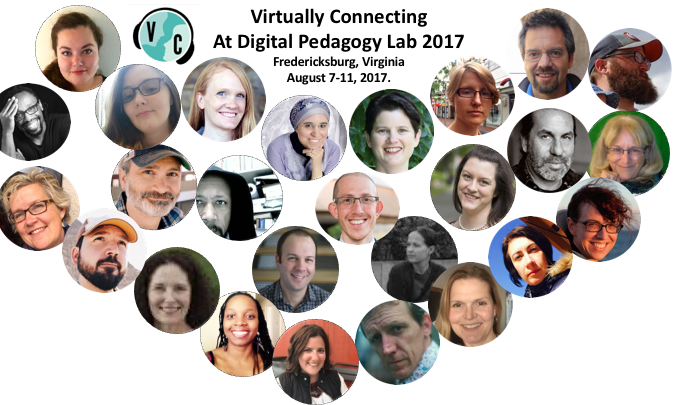 We’re connecting with Hybrid Pedagogy at the five day Digital Pedagogy Lab in Fredericksburg, Virginia at the University of Mary Washington on August 7-11. This five day event is described as a “five-day Summer institute that explores the role and application of digital technology in teaching. The 2017 institute will have four tracks, offering intensive peer-driven learning with and discussion of networked learning, new media, and critical digital pedagogy”. You can join into these conversations by adding your name to this form. We’ll send you an email to confirm, as well as the necessary information to participate. Join virtual buddies Terry Greene and Ken Bauer as they connect with on site buddies Daniel Lynds and Britni Brown O’Donnell to share conversation with Sara Goldrick-Rab, Chris Gilliard and George Station. Join virtual buddies Autumm Caines and Helen DeWaard as they connect with Rebecca Hogue and Maha Bali and Kate Bowles. This session is part of the Networks track. Join on site buddies Sundi Richard and Daniel Lynds as they connect with Kris Shaffer and Ashleigh Wade. Virtual Buddies are Alan Levine and Helen DeWaard. Join onsite buddies Rebecca Hogue and Britni Brown O’Donnell as they connect with Jesse Stommel & Sean Morris. Virtual Buddies are Ken Bauer and Christina Hendricks. Join onsite buddies Sundi Richard and Daniel Lynds as they connect with Amy Slay and Amy Collier. Virtual Buddies are Terry Greene, Ken Bauer and Samantha Veneruso. Join onsite buddies Rebecca Hogue and Sundi Richard as they connect with Lora Taub, Jenna Azar and Sue Erickson. Virtual Buddies are Ken Bauer, Terry Greene and Samantha Veneruso. Join on site buddies Daniel Lynds and Britni Brown O’Donnell as they connect with Martha Burtis and Robin Wharton. Virtual Buddies are Ken Bauer and Terry Greene. Remember, you can join into these conversations virtually by adding your name to this form. We’ll send you an email to confirm, as well as the necessary information to participate. Note: If you are onsite and interested in joining or watching, you are welcome to drop by, or connect with us via Twitter.